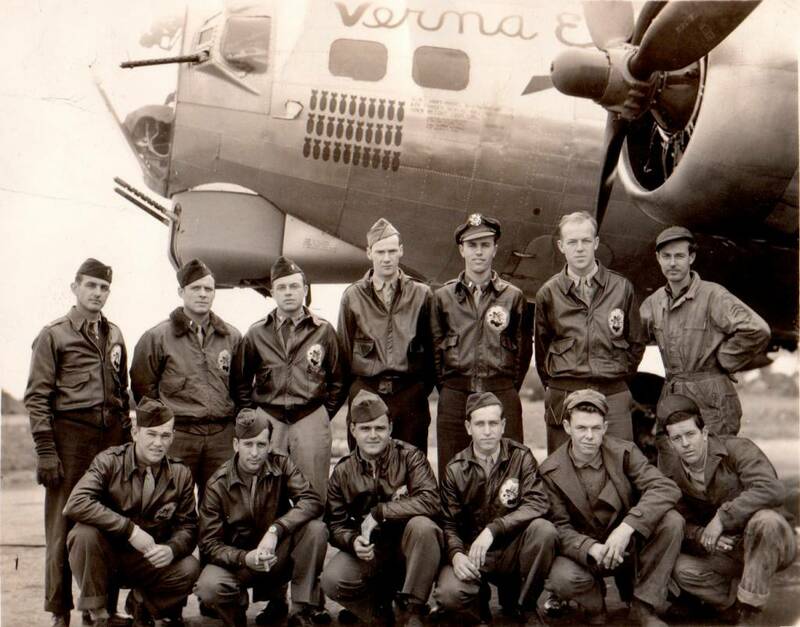 B-17 42-102975 / Verna E.
B-17 #42-102975 / Verna E.
Delivered Cheyenne 25/4/44; Kearney 3/5/44; Grenier 21/5/44; Assigned 369BS/306BG [WW-F] Thurleigh 6/6/44; Missing in Action Dresden 14/2/45 with Jack Henley, Co-pilot: Roy Stewart, Navigator: Warren Becker, Bombardier: Herb Whitaker, Flight engineer/top turret gunner: Vic Coppa, Radio Operator: Dan McCarthy, Ball turret gunner: Ray Hanson, Waist gunner: Albt Harcarik,Tail gunner: Fred Piepenbrink (9 Prisoner of War); flak KO’d two engines, crashed Nachtsheim, Ger; Missing Air Crew Report 12324. VERNA E.
Andere Webseiten über die B-17 42-102975 / Verna E.
I have several photos of this aircraft from early feb 1945 when it landed at Hardwick. If you are interested, please send me an email. Hi Don, I have send you an email. Would love to see the pictures. Raymond Hanson is my grandfather. B-17 Bomber Flying Fortress - The Queen Of The Skies - Home » Datenbank » Abschuss durch Flak » 42-102975 / Verna E.